Where you find people, you’ll find power, even if they’re working and living in the back country. Maintaining electrical lines in these remote areas can be a real headache, but Argo’s lines of XTVs make it easy to get your crew and equipment to the most inaccessible locations. Instead of using a UTV suspension and four small tires, XTVs have 6 or 8 giant tires that run at low pressure to absorb bumps while spreading out the weight over a wide area. This lets the vehicle float over snow, ice, sand, and mud, letting it go places where other vehicles would get stuck. This also gives the vehicle a low center of gravity for exceptional climbing ability and low risk of roll-overs when reaching poles on hills and mountainsides. The lack of a suspension system allows the skid plate to extend from the front of the vehicle to the rear, so there’s no chance of snagging on obstacles. 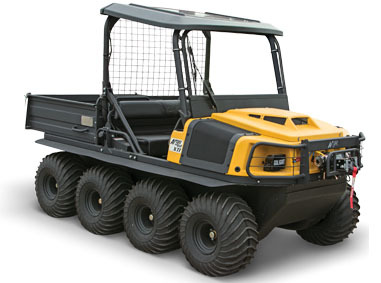 Water is no problem, either: Argo builds their machines with a leak-proof hull, and their tires have paddle-like treads. 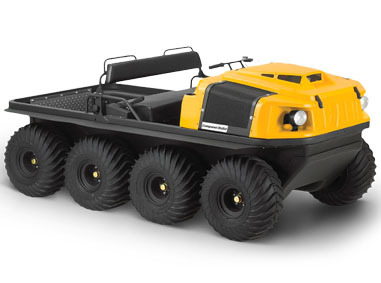 This lets them go through lakes, rivers, and streams like a boat, climbing on and off shorelines without assistance. Put it all together, and you have a vehicle that can reach lines on any terrain and in any weather, so you can maintain remote poles and restore power quickly when disaster strikes. All XTVs have the same off-road and water capabilities, but the rest of the vehicle can be tailored to your individual needs. It can be set up for maximum seating capacity or have a cargo area to carry your equipment. Need a place to work? The universal tool mounting system lets you attach equipment and power supplies, while a rear-mounted vise can hold poles for drilling. There’s also a captain winch available for dragging poles, moving downed trees and hoisting equipment. Need more light? There are a variety of lighting options from headlights to spot lights to make it easy to drive and see the work area at night. Line work is dangerous, and every minute it takes to get a worker to a health care facility increases the danger posed by injuries. Argo builds some models with mounts for a fold-out stretcher so you can evacuate the injured crew member immediately instead of having to wait for emergency services to come to you. It’s no wonder why Duke Energy has been using Argo XTVs for line maintenance for over a decade. Their coverage area includes the Blue Ridge and Great Smoky Mountains, which means linemen have to cover a wide range of wilderness terrain including steep inclines, forests, streams, and wetlands. Before these vehicles were put into use, the only way to access their most remote lines was on foot, requiring long hikes with workers loaded down with equipment. The increased productivity and work speed gained by adding these vehicles to their fleet have led the company to deploy Argos in several departments including emergency repairs and maintenance, with XTVs in a variety of configurations to fit each role. 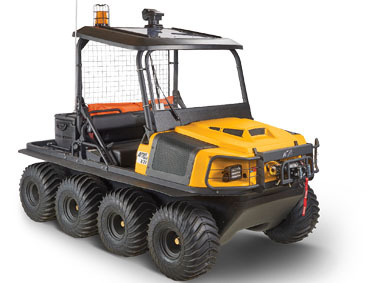 No matter where you need to maintain power lines, Argo’s XTVs can help, delivering people and equipment regardless of terrain and weather conditions.